A vibrant night at the Tigers Stadium for the awards night, hosted by Emma Jesson. 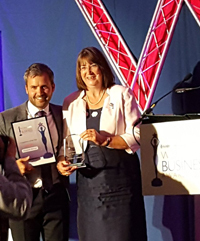 To her surprise our vintner, Liz Robson, won the “Entrepreneur Award” for 2017, which she considers a testament to not only her own hard work but the sterling support from Matthew Broughton, Laura Hadland and some amazing volunteers. Little time to linger for photographs as Mabel had to be collected from doggy day care and then preparations made for harvesting some 6 hours later!!! Copyright © 2019 Rothley Wine Ltd. All Rights Reserved. The Gridiculous Theme by bavotasan.com.